The Ceratosauria represent the earliest theropod dinosaurs (and indeed may include the ancestor to all later theropods, which would make them a paraphyletic group, i.e., invalid, although this has not ever been established). Ceratosauria first are seen in the fossil record in the late Triassic period, some 225 million years ago. Currently, Ceratosauria is considered to be the sister group to the Tetanurae, which are a more diverse group of later theropods. Known specimens of ceratosaurians show that the group began to exhibit "bird-like" features (more appropriately, birds show ceratosaurian-like ones) early on. The bones of ceratosaurians, like those of all known theropods, are hollow. Hollow bones actually are stronger in bending than solid rods, so this could have been an initial reason for this feature. Birds have taken this step even further, having large air-filled spaces in their bones. Ceratosaurians also had strongly curved S-shaped necks like birds do; this is a trait inherited from a distant archosaurian ancestor. One diagnostic characteristic of most of the Ceratosauria (except for Ceratosaurus, which was an oddball that appeared long after the other ceratosaurs, and may not even belong in this group) is the loose attachment between the premaxilla (the most anterior bone of the upper jaw) and the maxilla (the main upper jaw bone, posterior to the premaxilla). A large tooth from the lower jaw normally fits into the notch formed by this loose attachment. You can see this character clearly on Coelophysis and Dilophosaurus. Examples of the Ceratosauria include Ceratosaurus nasicornis, the largest well known ceratosaur (up to 25 feet long and bulky), distinguished by its fairly prominent nasal horn. Ceratosaurus was around in the Late Jurassic, about 145 million years ago. Another example of the Ceratosauria is Dilophosaurus wetherilli, another large (about 20 feet long and fairly slender) ceratosaur discovered in Arizona by the UCMP's own Sam Welles. Dilophosaurus is distinguished by the large paired crest on its head. UCMP proudly houses the only three known specimens of this famous dinosaur (although other remains exist that may be referrable to this genus). A larger specimen from China has been discovered recently. Another unique ceratosaur housed in the UCMP collections is Segisaurus halli, a small (about three feet long) ceratosaur described by the famous UCMP field paleontologist Charles L. Camp in the 1930's. It was discovered by a UCMP field crew in the Navajo sandstone of Arizona. Two mysteries about Segisaurus perplex paleontologists. First, the specimen is nicely preserved (but fragmentary), except for one fact  no skull! It is the only specimen of its kind, and its relationship to other ceratosaurs is complicated by the fact that we are uncertain of what its head looked like. It may in fact be a ceratosaur that we already know of rather than a unique genus (but this seems unlikely due to a few unique features that it possesses). Another, more confusing fact about Segisaurus is that the bones appear to be solid according to some paleontologists. As you may know, theropod bones are hollow, so it would be amazing to find a theropod without hollow bones. However, the seemingly solid bones may in fact just be an artifact of the chalklike preservation. Paleontologists at Berkeley are currently working to solve the mystery of our Segisaurus. Coelophysis bauri is a smaller (about 6 feet long) representative of the Ceratosauria. Fossils of Coelophysis have been found in huge assemblages in New Mexico, hinting that some theropods may have been gregarious. An example of a beautiful specimen of Coelophysis is depicted above. The UCMP has a fine specimen from the Petrified Forest of Arizona (a paleontologist's paradise). 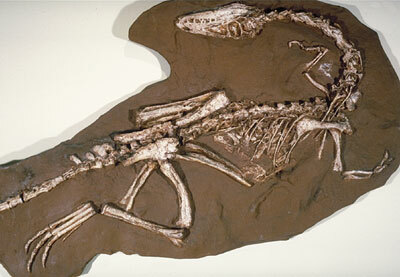 Coelophysis is one of the earliest known theropods, and has many features common to the group. Its closest relative within Ceratosauria seems to be Syntarsus, another, smaller dinosaur known from excellent remains found in South Africa and Arizona. That's it for the Ceratosauria for now; future pages are planned. You may wish to go now to the Tetanurae, the rest of the theropods. 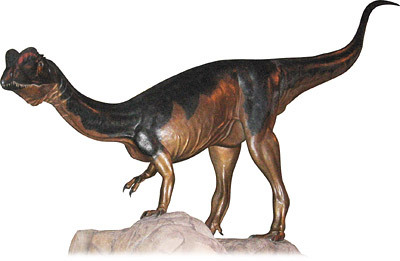 Visit a very special account of the discovery and reconstruction of this ceratosaurian dinosaur. The exhibit is narrated by UCMP's own Sam Welles, the discoverer of Dilophosaurus.